“It was a time of poverty, uncertainty and shifting fortunes.” These were the comments made by Bruce Robinson and seem to accurately sum up the prevailing mood throughout the country during the middle of the sixteenth century. In January 1549 Crammer’s Book of Common Prayer was introduced and the first full English Church Service was conducted, to further rid the churches of all traces of papal influence, stained glass windows and statues of saints were being smashed, painted walls white-washed and vestments sold. With the increasing resentment felt for the gentry by local agricultural communities due the practice of enclosing common land on which villagers grazed their sheep and cultivated their crops and the upheaval brought about by the Protestant reforms, the country had become a powder keg that was waiting to explode. Though East Anglia seems to have accepted the religious movement towards the Common Prayer Book and all that it entailed, there was anger at the gradual erosion over the years of their right to graze their livestock and grow their crops. In 1520 the villagers of Sculthorpe outside Fakenham, had made representation to the Star Chamber that Sir Henry Fermour had pastured 800 sheep on the whole of the common land when he actually owned only just five acres common land. At Walsingham in 1537, under the cover of an archery competition held at Binham, a plot was uncovered to organize a protest against what was a local injustice and which later led to the execution of the leaders. Such sporting activities around the region were used by the rebels as a disguise for these illicit meetings and the gentry were extremely concerned at what plans were being laid there as well they might. In 1539 there was a protest by the inhabitants at Hincham against Sir Henry Parker who had enclosed part of their common land. A great strength of feeling erupted at Griston in 1540, when an outspoken John Walker ‘wanted to raise West Norfolk by the ringing of church bells, to kill the gentlemen and to “spoyle” the large men of the district’. He also claimed that at Swaffham 10.000 men were ready to rise up though nothing seems to have come of it and was probably wishful thinking caused by overzealousness. There were disturbances at Great Dunham in 1544 because Sir Thomas Cody had ignored a Star Chamber ruling that he should remove fencing he had placed around common land. General unrest and village uprisings were reported at Buckenham, Fincham and again at Swaffham. Diamond McCulloch in the comprehensive research he carried out for his thesis ‘Kett’s Rebellion in Context’ concludes that the popular conceptions surrounding enclosures are in his words, ‘very ambiguous’ because the counties of Norfolk and Suffolk contained two geological areas which produced different agricultural structures. One area consisted of two belts of light soil where sheep were pastured and the subsequently well fertilized land produced high yields of corn, the largest of these stretched from the northern half of West Suffolk, the North Norfolk coast and except for the Fenlands that bordered Cambridgeshire to Lincolnshire, the whole of West Norfolk (see map). Within this sheep-corn area were situated the rebel camps of King’s Lynn, Downham Market, Bury and Melton. Running diagonally and separating these two regions is the heavier soils that cross Suffolk from Haverhill in the extreme south-west to the south-eastern third of Norfolk named ‘the Woodlande and High Suffolk’ by an early seventeenth century topographer. As the name implies this was a well wooded region mainly given to pasture but with plenty of corn being cultivated as well. This open-field system was also to some extent being enclosed and together with common land and Articles 3 and 11 of the demands drawn up by Kett’s company on Mousehold Heath were a clearly intended to cover this situation. Though it appears from the previous paragraphs common land was also under threat in the Norfolk area of lighter soils, there was also in operation what was known in the region, as the foldcourse system. ‘The shepherd begins to tath at May-day and continues until a month before Christmas . . . 200 sheep will that a statutable acre in 7 nights . . . if you have a piece of ground extraordinarily tathd pitch ye fold ye less straite’. Mr. Graves at Hoggington hath 2 Fold Courses one hath 500 sheep and the other 300 sheep and folds 1 acre in 4 nights . . . they use and begin to tath at Lady Day and continue to Hallowmas but intermitt at wet times’. According to Bruce Robinson, in year before Kett’s Rebellion there were accounts of rioting breaking out at Great Yarmouth, Castle Rising, Middleton and King’s Lynn. However the Rev.F.W.Russell feels that Bloomfield, who also states that this was the case, was mistaken because he draws his conclusions from some other events that he feels were not connected. As will be shown later, there was a designated meeting place that has been suggested where the rebels gathered at Castle Rising and it is more than feasible that this was used over a period of time for such a purpose. A local parson called John Chaundeler from Ailthorpe, which may have been the village north of Fakenham named Althorpe now extinct apart from the Alethorpe Hall as shown on a modern map, reputedly have fled from the camp at Castle Rising is quoted as saying “I would the town of Lynn and all the gentlemen there were on fyre”. These allegations had been made because the ‘gentlemen servants’ had been killing the labourers who had been working in the fields. A year later according to Julian Cornwall, a ‘John Chandler, a parson from Alswinthorpe near King’s Lynn’, had on the 6th August 1549, ridden to Colchester and there in a house of one William Brown he met with several members of the town. There does seems to be some confusion as to where this local rector mentioned both by Cornwall and McCulloch actually lived as McCulloch states ‘One of the Norfolk rebels, the parson of Gayton Thorpe near King’s Lynn spread reports at Colchester of events in East Anglia’, whether he is one and the same man only further research will show. This man or men of the cloth had tried to convince those gathered at William Brown’s of the worthiness of the cause and to support Kett by telling them that at Bury St.Edmunds he had come across not less than 7,000 men coming from Langham, Brandon Ferry, Ely and various other local towns. Also according to Cornwall, the Suffolk rebels were not active at this time, having been subdued by the authorities but McCulloch in his investigations has found that despite the defeats suffered at Cambridge and Great Yarmouth, by the middle of July there had been in both Norfolk and Suffolk quadrilateral camps established at Norwich, Downham Market, Ipswich and possibly according to the parson, Bury St Edmunds. As spring moved into the hot summer of 1549 and temperatures started to rise, so did the unrest around the country with the various grievances that so many of the population were expressing at that time. In the South-West on 6th June at Bodmin, three days before the introduction of the Common Book of Prayer at St Petrock’s church, there was a great deal of unrest within the town. A few days later on the 11th June a Whitsun-Monday a few miles away at Samford Courtney, the priest there was forced by the congregation to abandon the new service book and say the Latin Mass. According to letters sent to the Marquis of Dorset and the Earl of Huntingdon by King Edward V1’s uncle and Regent, the Duke of Somerset wrote to say that that there was also trouble in the Midlands. On hearing of the disorders in Kent and Hampshire, the Mayor of London, no doubt anticipating unrest within the city, ordered a nightly inspection of constables to see they kept the hours of duty appointed for them. This was possibly the fuse that lit the powder keg that was smoldering in Norfolk. It is unclear in reading the accounts that have been written of that fateful summer the actual sequence of events that unfolded. There were various disturbances throughout Norfolk and on 10th June in Attleborough there was the systematic destruction of enclosures which was remarkable in the peacefulness of its execution. It is felt that this event perhaps, more than any other, launched all that unfolded on the Feast of St Thomas a Becket in Wymondham on 8th of July 1549 where the whole town met for the Fair to celebrate the day he was appointed the Archbishop of Canterbury. It was during these celebrations that the crowd, no doubt having ‘wined and dined well’, decided to go to Morley and then on to Hethersett to the notorious Mr. Flowerdew’s, and to pull down any offending fences that he an others had erected. As there are several books that have been written giving a full account of Robert Kett and his Rebellion, some of which are noted in the reference section at the back of this chapter, here is not the place to recount in detail that story. It is now proposed to explore the part that our local area played in this important piece of our East Anglian history, especially that of Castle Rising. It was here that a camp became the focal point of gathering for the rebels who lived in North-West Norfolk and the surrounding villages and towns such as King’s Lynn and Downham Market not only in 1549 but also in the previous year. It could prove an interesting exercise to examine the reasons why the village was use as a gathering point; it may well have been the geographical position and the proximity to King’s Lynn being an administrative centre and like most other camps, such as Yarmouth, Bury St Edmunds, Ipswich and Norwich, the sighting of them near such centres was an important strategy for the rebels when challenging and gaining control of local government. Another factor to consider which linked Castle Rising with the inhabitants of Wymondham and also much of Norfolk and Suffolk was the power enshrined in the liberty of a medieval franchise of their former Lord of the Manor Thomas Howard, third Duke of Norfolk. The Duke was a conservative landlord who had retained his bondmen longer than was the general trend within the country and when the act of attainter brought by Henry VIII in 1547 against him because of the act of treason by his eldest son Henry Earl of Surrey, who had been involved with Catherine Howard and consequently executed, had resulted in all the estates being escheated to the Crown, Sir Richard Southwell being appointed the steward to those in Norfolk. With his removal from power in 1549, some of the Howard bond tenants had been embolden to petition in Protector Somerset for manumission when they asked for their freedom in ‘the charity of Christ’, this language was echoed in the articles drawn up by Kett and his group at Mousehold Heath revealing a common thread that would certainly bind together the bondmen belonging to the Howard estates both in Norfolk and Suffolk including those at Castle Rising There are 46 former Howard bondmen in their manumissions recorded in an enrolled Chancery warrant and on the patent rolls between 1550 and 1553 who say that the third Duke of Norfolk had used “much more extremitie then his Auncestoures did”. This certainly underlines the strength of feeling that was aroused by their former landlord and the tight hold he had on their lives and the contempt in which he was held. According to H.J.Hillen there was a ‘minor’ camp at Castle Rising to which ‘many flocked from Lynn and the neighboring villages’ in July of 1549. He states that four aggrieved tenants of the Lord of the Manor of Burnham were responsible for the high feelings that were running there but as we have noted previously that this was possibly not the only reason. A large pit has been identified by Bradfer Lawrence as the rallying point for those who gathered there from the surrounding areas, this is just outside the extreme eastern boundary of the parish and named by him as ‘Kett’s Castle’. The most likely spot for this is the Stone Quarry on the boundary of Castle Rising and Roydon Common and is a suitable hidden site for those disaffected bondmen in both the months preceding and that the final gathering to hold their meeting. During a perambulation of the parish boundary in 1732 (N.R.O.) this was referred to as the ‘Old Stone Pit’. More recently, according to local tradition, a slight mound in a field adjacent to the Old Flax Factory on the West Newton to Roydon road, has been identified as another likely candidate for the so called ‘Kett’s Castle’. Near this mound are pits filled with water which are known as ‘Kett’s Pits’ adding strength to this locally held belief. Proving which one of these may have been the gathering point is more or less impossible and one can only conjecture which of the various locations was used. The Stone Quarry does lend itself as a concealed area in which to hold meetings while the mound is more suitable for an encampment with water being near by and the elevation of the land being good for drainage to keep any equipment dry, perhaps it is that both of these sites were occupied by the rebels at various times. When the rebels gathered at Castle Rising in those days of early summer, their plan was to mount a surprise attack on King’s Lynn but this was brought to naught being repulsed by the governor of the borough, Sir William Willoughby and the local gentry. As a result, the rebels went onto attack the Hospital at Gaywood the site of which is now the Alms Houses on Gaywood Road in King’s Lynn, where after driving out the inmates and taking away their common stock, they razed the chapel and many of the buildings to the ground. The Hospital of St Mary Magdalen at Gaywood was a religious foundation and from the twelfth century and was dedicated to the care of the leprous and continued for over 400 years until Edward VI, carrying on the work of his father Henry VIII, dismantled it and seized the wealth. Anthony Avis in his book on Gaywood, states that he found written in an old manuscript on the history of the Hospital that it was so wasted and spoiled that it never again supported the destitute as was the intention, but the Mayor and Burgesses of Lynn did manage to continue to look after some poor people there. It seems a tragedy that the rebels vented their frustrations on these innocent victims as this could not have aided their cause in the eyes of the people. Must be the old oak at Ryston’. On completing their court proceedings, the company moved onto Watton where they made camp, for here it was they were in command of the nearby river crossings at Stoke Ferry, Brandon and Thetford; the main route which would be taken by the King’s Army heading for the main camp at Norwich on Mousehold Heath where approximately 15,000 rebels assembled. 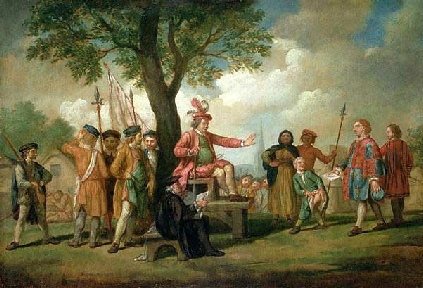 After two weeks Robert Kett had summoned these rebels to the Heath, where they were more secure from attack and more important, had the promise of regular provisions. It was at this time he formed his ‘Government’ consisting of two representatives from the 24 Hundreds which made up the administrative area of the county. Among two of the’ Governors’ appointed from 15.000 assembled were William Heydon and Thomas Jackson from the Freebridge Hundred representing Lynn and the surrounding district including Castle Rising. Despite their discipline and organization they were finally defeated by the Earl of Warwick and his army at Dussindale, an area to the north of Norwich. The Kett brothers Robert and William were brought to trail at the Court of the King’s Bench on 26th November 1549 found guilty of treason and sentence to death. At 57 years, Robert Kett, whose ancestors originated from Denmark and as we shall see later this could have had a great influence on his attitude to authority, was a tanner and butcher by trade, also a yeoman farmer and landowner. A mature and established man, a churchwarden and member of the guilds of St.Thomas and St George who belonged to the local Watch and Play Society, seems an unlikely person to lead a rebellion against the establishment as by doing so he had much to lose. In many ways he was a man before his time, part of a growing section of society that was middleclass, affluent and with a social conscience. They were pressing the authorities to acknowledge that they were capable of running their own affairs, especially at a local level and also wanting the government of the day to limit the powers of the landowners in their bid to enfold the common land. It was perhaps inevitable, that on Monday 8th July he should join the men, many of whom must have been his friends, in the destruction of the fences, even of his own. Realizing that perhaps direct action was the only way in which they would have their grievances heard, even though it went against his nature as a loyal servant of the King and country. Kett had somewhat naively believed that he would by this action, gain the approval of the ‘Good Duke’ as the Duke of Somerset and Protector was called, who had been trying instigating an ‘Enclosures Commission’ which would eventually contain the power of the landowners. He was sympathetic to his people and showed his concern for the common peasant and their lot in life by having their claims heard in the ‘Court of Request’. Kett’s hope was that the Duke would be grateful for the support people were showing in his reforming ideas that would curb the greedy and covetous officials who were determined that the ‘status quo’ should remain and their profitable way of life should be allowed to continue. Unfortunately Protector Somerset did not see the rebellion in that light, but as a threat to the authority of the Crown and State that had to be quashed at all costs. Robert Kett and the three ringleaders were men of prosperity not much lower in society then the gentry’s class. John Levet captain of the Bury rebels was like Kett a butcher, whose uncle was a minor gentleman and one of the bailiffs of Bury who left him 20 shillings in 1552. Captain Brand at Ipswich held the rank of second officer in the borough of Ipswich l540s including that of chamberlain. These men were therefore only a step below the governing classes and able to challenge not only the country gentry but those in office in the larger towns and the Articles they produced at their camp at Mousehold Heath emphasized repeatedly the sense of alienation felt by the leaders from those in immediate authority over them. In these demands they were seeking to remove the gentry and the clergy for any control over their affairs and they were fighting with the Crown against what were felt to be at that time, the misdeeds of the magisterial class and was not unusual to find within the ranks of the rebels officers such as constables and churchwardens. A great deal of planning and organization must have taken place to enable the swift and rapid establishment of four camps in Norfolk and Suffolk. They had also chosen a good time for the insurrection as during the summer months the gentry, including the Sheriff of Norfolk and Suffolk, Sir Nicholas L’Strange, left the country-side and moved to London only returning when the plague became a threat and the business of harvest on their estates became pressing. The uprising of 1549 had the support of approximately 50 villages and towns across the county of Norfolk and a following of inhabitants from various occupations including butchers, due no doubt to the many sheep raised in the area, there were farmers who must have had useful points of contact at the many markets, also artisans, fishermen and wheelwrights to name but a few. According to R.J.Hammond, this rebellion was not just the result of agrarian changes but also to the external forces which had been operation since the Danish invasion which had established a peasantry that was extremely free in comparison with the indigenous population. The full weight of the manorial system never seems to have fallen on these migrants but whether from this or from economic causes they seem to enjoy great prosperity. They were apparently an aggressive and litigious people who fought to preserve the rights that they had but were eager to acquire even more being conservative in nature rather than reactionary. They soon learn to use the Courts of Request and the Star Chamber against anyone who dare to infringe their rights and where powerful enough in the changing economic conditions to hold their own against any opposition from those above them. In the mid-sixteenth century the free for all land grab brought about by the Dissolution of the Monasteries, the devaluation of the coinage and the subsequent rise in prices began to turn the economic tide against these entrepreneurs and as a consequence they felt that a show of force was the only way to make their voices heard again. The demand at grass-roots for democratic reform and the need to reduce the powers of those whom they felt were trying to suppress them was clearly evident. That Kett was hanged as a traitor from the walls of Norwich Castle on seventh December 1549, something he felt clearly he was not, was in its self a tragedy for so loyal and moral a man. To-day he will be seen in a very different light through having the well being of the common people very much at heart. The formation of his ‘Government’ at Mousehold showed that his aspirations were for this to be the model for the country as whole and that it could become the fair and just society which we hope we now have today. If Robert Kett was known to inhabitants of Castle Rising and this is more than a possibility, his untimely death and its manner must have spread a cloud of despondency over the village. But their hope of a better way of life that had been kindled by the movement may not to have been totally extinguished as can be seen by the various petitions brought by the Howard bondmen requesting their freedom; whether this was sought by any of those living within the manor Castle Rising has yet to be discovered.